new to the site as of today. Looking to buy a F250 anywhere from 72-79 (my favorite body style) and had some questions. I basically want a truck that I can use a mudding truck/trail riding and any other times I would need it. I have a daily driver... so I wouldnt be using this to commute or anything like that (unless daily driver broke down). I've been reading through the forums and trying to figure out exactly what I want/need. From what I've gathered on this site... a High boy would be the easiest solution for what I want to do, because it has the divorced transfer case and a lift kit stock from factory. Problem is is that they are a little more rare to find. The guy wants $1700 for it, which is more than I want to spend. I was basically looking for something around $1000, so I could consider it a "toy"
There is also a guy who has a 75 high boy for sale, very nice condition for $4200 (oregon truck brought over here). That is way out of my price range... but damn is it a nice truck. Hopefully I dont sound like too much of a noob, but any comments and/or suggestions would be appreciated (mostly regarding the 79 f250 with specs listed above). Welcome to FTE lots of information as you can see I'm sure. Ok 73 to early 77 HIBOY are nice but here are some draw backs fuel tank behind the seat, And the one I hate the most is the ram steering followed by the narrow rear frame section. The 79 if it is pretty clean as far as rust would be a good starter for what you want. I would say the 460 was swapped in. As to the danna 60 front you can buy one and swap it in down the road. Yeah 35s with no lift mite be a tight fit but who is to say if there has been any mods but like I said sounds like it could be a good start. Offer what you think the trucks worth then go from there. 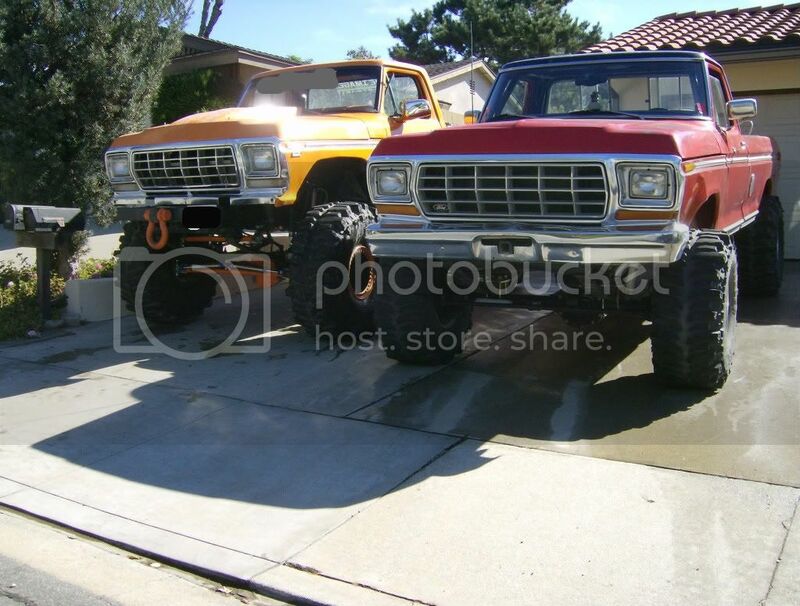 I have a HIBOY and a 78 f250 love my dents. depending on where your at(sounds like your eastern), 4200 might be a decent price. i love my highboy, but im kind of thinking i should have bought a 78-9 for what i want to do. the highboy will get into alot of custom fab because no one makes parts for it. theyre hard to find, and even harder to find parts for. if the 79 is in decent shape, i would go that route and put a lift on it. the highboys are tall, but because of the springs in the rear, they ride terribly. the 36s on mine have smoothed it out quite a bit, but im considering putting the long chevy rear springs under the rear(more custom stuff). highboys are nice, but unless you can do some stuff, it's a pretty hard truck to work on because of parts availability. Welcome. $1700 doesn't sound too bad. Remember you get what you pay for. I've never bought anything used that I didn't have to put money into. The less I paid, the more I had to throw at it. Keep in mind that as kickass as these trucks are after 30 years of unknown treatment problems can arise. Go over it end to end and get to know it before taking off on any big adventures. I too have a litter of dents and I have to say I love each of them. I change cabs on all of my early dents and install later 78/9 cabs, so I can get shoulder harnesses and ditch the in cab tank, though I dont mind the narrow rear frame. See, the narrow rear frame places the springs closer together and permits some degree of forced articulation. This artificially changes the spring rate based upon the axle having more leverage applied to each spring during articulation cycles. Early trucks do have a divorced t-case, which can be a good thing, and it ca also be not so good. Note that the 203 transfer case found in many of these trucks are not as desireable as the 205. The early trucks have low pinion axles, and some have drum front brakes. This too is not very desireable. Taka all of this into consideration when you look. If any of the trucks has equipment that you desire, then this would be an added value. If you find a truck that might require some changes, then this value ould have to be considered when purchased. In other words, if a truck has good tires and wheels that are the same size or close to what you desire, then this might be worth a few extra bucks during the time of purchase. That 1700 dollar truck might be a good deal considering that the other 75 optin might have drum brakes, and a low pinion closed knuckle D44 front axle and might also have a NP 203 transfer case. See to me, the 75 is not very desireable because I would have to change so much to get the truck where I wanted it in when it was complete. Many variables here. Much probably has to do with what you intend to do with the truck. How high do you plan on lifting it? How do you plan on driving it? Is it gonna be a fire breathing off roader, or are you gonna install some heated seats to keep your bum warm when you drive? These consideration might come into play. Yeah but you wouldn't have to smog it out here. That's worth ALOT to me. But like 75F350 said, it's all about how you are going to use it and what your ultimate build plans are. First of all... thanks for the quick replies everyone. My thoughts on the 2 different trucks are basically that the hi-boy is too much money for too nice of a truck. It is probably a pretty good deal, given its "rarity" and the condition it is in. The seller states that the truck is 99.9% rust free and has no mechanical issues. That isn't really what I am looking for... because if I take it out on a trail or something, I dont want to worry about scratching it or accidentally denting it or something. And with parts even more "rare" - I think I would skip this truck. I suppose my question is basically whether or not the 79 is worth the price, and if it will provide what I need/am looking for. I don't want to get the truck then pull the axles, and do this and do that - I just want a fairly decent running truck that I can play around with on the weekends. I can fix things that break or need to be upgraded, but I dont want to turn this into a show truck. 1. with the stats that I listed for the truck in the first post, would those be a pretty good "base" to work with for what I want? 2. Haven't heard back from the seller yet, but if this is a 79 4x4, does that confirm it has the C6 transmission and the NP205 transfer case? 3. Is there a link or another post that would give me a pretty good "checklist" of what I should look/ask for when going to look at the truck? Well Fordworth makes a valid point, when he discussed the desirability of early trucks out here in So. Ca. The trucks here are smog exempt of it is 75 or older, so there is something to consider. Anyway, the pile in my avitar is a plain jane nothing special 74 F250 with a mild injected aluminum head roller motor. (cubic inches are a secret, shhhh.) This has an automatic transmission with overdrive and lockup converter. It uses a controller and a come fancy wiring to make it work. It was born with a 203 t-case, and has been upgraded with a twin stick 205 (soon to be a doubler,,,,maybe). I have a modified D60 rear with (D70) 35 spline axles and Detroit locker. Front is a 79 D60F with a modified power lok, and carbon fiber clutches, modified case and saftey wired aircraft grade fasteners. This also has 35 spline outers, and broached spicer lockouts. Both axles are spun by custom made driveshafts from (JE Reel) "Reel Shafts" in Pomona Ca. I run 39.5" boggers most of the time, but the truck wears 39.5" Iroks and 42" Iroks once in a while. On-board air, and nitrogen cylinder for field repairs. Recovery points front and rear, and a rear mounted winch for self recovery should I find myself no longer capableof making foward progress. All of this sets on a slightly modified frame and suspension is donated from a 99-04 Super duty. I use 8" front springs from BDS. Stck front hangers, and self made shackles. Self made u-bolt flip was added when the upgrade to crossover steering was used. The steering box is a Saginaw 4 turn 16:1 unit that was laying around in some junk motorhome parts. Stainleess steel brake lines makes sure the brakes are good and reliable. The brakes have been upgraded to F350 1 ton master and booster. Rear suspension consists of bone stock 2500, or 3500 chevy 64" springs. They are attached using an asortment of stock chavy hangers and stock ford hangers to accomodate the shackle flip in the rear. Full roll cage inside, decent satellite stereo, Single 10" JL sub, and cerwin vega speakers. Rockford Fosgate amps (two) takes care of amplification. Cobra classic 29 LTD CB keeps me in communication with other wheelers. Bedlined interior makes wash outs a breeze, and hold up to the 1 1/2 inch water pump that is used to wash the truck after a day of mudding. This truck serves it purose well, and acts as a tow vehicle for the many dents that I drag home. It was painted with rustolemm and was shot at home. No fancy paints here. Makes touch up a breeze. You can count on a rattle can of touch up being in the tool box, and once in a while I actually spray a little while on the trial. I am a jokester. Anyway, that is my story and that is my junk. I found this truck, well most of the pieces in a local farm. Some chickens were running around in it, and a darn goat was using it as a shack. Every once in a while, I still think I can smell those darn chickens. I found mine for free, and have spent a couple of bucks making it what she is today. Nice driver and not bad for an old truck. It gets quite a bit of attention, especially at gas stations and stuff. My daughter (10 yrs old) has had her hand in most of the fabrication, and she has done a majority of the welding. She swears this is her truck, and as far as I am concerned. It is, she just lets me drive it until she is old enough to have it all to herself. Guess I will have to drive one of my other piles after that. Whatever dude. Now I can never go wheelin' with you. I would embarrased to park next to you. Ahhh, I dont know abot that man. Your ride is sweeeeet! Wow I'm half confused as to what you said. It seems like your truck has a 75 body, and everything else is from other trucks. Hopefully I can test drive this 79 soon. What should I be looking for as signs of problems? rust is the most common in the cab corners, along the drip rail, the frame, the wheel wells, and the floor pans. 75F350, I thought your truck was a 75 F350. maybe I'm just stupid. You should also look for rot on the roof near the gutters around the windsheild and rear glass inside the cab and from outside the cab, floor pans front and rear cab mounts, radiator support these are some fairly common problem areas on trucks out on the east coast. There are other areas too but these are some of the more involved areas to fix. Good luck and hey keep us all posted. 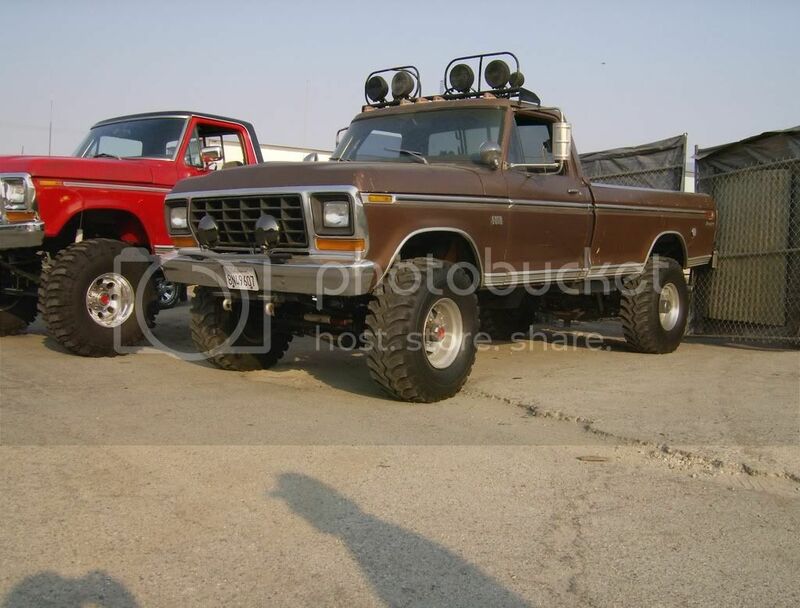 75F350, whose brown truck is this next to yours?